Booking tickets for my Madurai-Bangalore trip was a very simple process – no confusions and no hassles. There was only one operator with a day trip, and that was KPN. I wanted to try VRL or SRS, but neither of them had a day trip and I did not have the option of taking a night trip (I had to be in office on time the next morning, and I could not risk taking a night bus). The ticket was booked through the KPN Travels’ website. I chose Seat #43 for my ride. 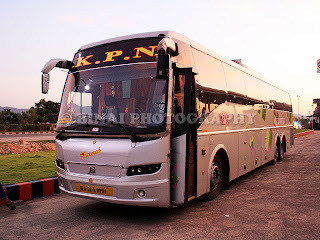 A few days before my trip, a few photos appeared on the net showing a brand new bus running the trip I had booked on. I was excited, and was looking forward for the trip in a new bus - but did it really happen? A few hours before my journey, I headed out to MIBT to meet a good accomplice of mine and a fellow bus fan. We spent some good moments at MIBT and then returned to my hotel room. I had confirmed earlier in the day that my bus would depart from Periyar only (considering my experience with SRM). The breakfast that morning was too heavy and I did not feel hungry for lunch at all. But considering that the first break for my bus was at least 3~4 hours away, I had a very light lunch and headed to Periyar BS. As we entered the place from where private omni buses depart from, locally known as complex bus stand, I noticed one KPN bus already standing there, along with an SRM B9R. That KPN bus was heading to Chennai. Jayasankar was taking that bus. Boarding hadn’t commenced then. So we stood outside the bus, till a guy from the office came with charts and started boarding. While Jay got in the bus, I headed to the KPN office to confirm that my bus too would be picking up passengers from there. They confirmed the same, and I returned to the place where the Chennai bus was parked. SRM was still there. The scheduled time for the Chennai bus was 1315, and surprisingly the bus left at 1314hrs – quite unusual for a KPN! There were lots of passengers waiting for the Bangalore bus at that time. My bus was brought in at 1321hrs – for a 1330hrs departure. The bus was KA-51-A-9994, an old and run down silver coloured bus. My hopes of travelling in a new bus shattered – and as if it was some background music, my mobile rang. 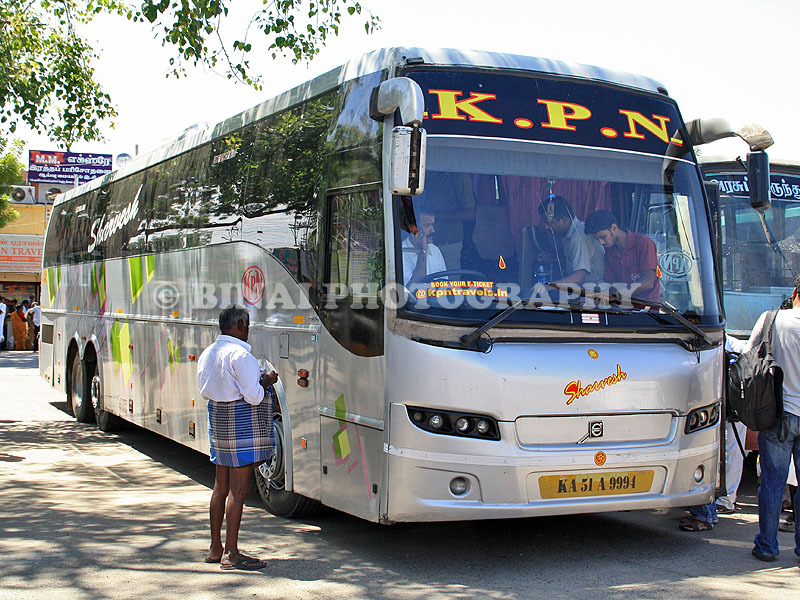 It was an SMS from KPN reminding me of the journey – the bus number mentioned in that message was of a fairly new bus! Salt to the injury, I thought. The Bus: KA-51-A-9994. It had run 5.4lakh kms. It looked all bruised and run down on the outside. I got into my seat as soon as boarding commenced. The first thing I noticed was the humongous leg space – it would be a nightmare for an overnight journey, since I’d keep slipping off the seat every now and then! Boarding was quick – but the drivers had just gone for lunch. I came to know from the bus that was being operated for the 1.30pm from should have actually worked the 3pm trip – but they had to prepone the departure due to some operational issues. So the crew weren’t prepared for the early departure. Despite all this, we managed to depart at 1331hrs – now that is impressive by KPN standards, since we were late only by a minute! The bus took the flyover and went through the route used by city buses going towards Theni road. Our bus also took a turn towards Theni, and then entered the new bypass road from there. The curtains were closed (but I kept a portion of it open) and the cleaner played a movie – the same movie that I had seen on SRM! Sadly, the cleaner had only one more DVD and hence I had no other choice but to watch it all over again. The driver at the wheels was amazing – he kept pace, was not rash, and used the horn to the minimum. The top speed he hit, according to my gps, was around 105kmph. We reached Dindigul bypass at 1435hrs. We had a couple of passengers to join from here. We left from there at 1437hrs. The driver was back to business. The second driver, in the meantime, was on phone talking to their office in Salem, arranging for new tyres to be sent to their fuel station to be transported to Bangalore. The guy at the wheels was really quick, and his driving style was fairly safe. Our next pick-up was at Karur (1530/1534) – around 11 passengers got in here! The bus had a lot of bookings to Salem from Madurai – I was really surprised by the number of passengers taking this bus to Salem! Meanwhile, the bus was belting through the 4-laned National Highway towards Bangalore. The run from Karur to Salem was largely eventless. The driving was disciplined. I dozed off for a while, and spent the rest of my time watching the movie all over again. Increasing traffic on the road signalled the arrival of Salem. We were soon running past the iconic NH flyover in Salem and heading towards KPN’s fuel station in Salem. The bus pulled into the fuel station at 1647hrs. 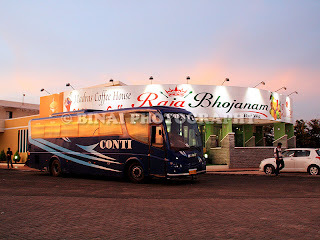 There was one more multi-axle bus standing there as we pulled in (guess it was coming from Trichy). I headed to the Bakery and got some snacks and some cold drink, and got back into the bus. After filling up, they pulled the bus out of the pump and slowly parked on the road side. The pick-up bus with passengers boarding at Salem was yet to arrive – the drivers were cribbing about this all the time. Soon, a TATA ACE came with the tyres – that was dumped into the luggage boot. While the tyres were being loaded, the minibus with Salem boarding passengers also came in. We started off from Salem at 1710hrs – with all seats full. The first driver was still at the wheel. He picked up speed soon after we returned to the highway. KPN uses a mini-bus for all its town pickups in Salem now – the actual bus waits at the pump for the passengers. That is a good thing for long distance passengers. Soon after we started from Salem, the second movie was played – this was an unseen movie, and a very good one too. The driver kept pace all the time, and he glided past the Thoppur ghat with ease. The bus did not stop at the usual A2B post Thoppur, instead kept going ahead and stopped at a new restaurant “Rajabhojanam” a few kms ahead (at 1803hrs). This place had better toilets and a better dining area than A2B. But the hotel was still not being able cope up with the load – their systems need to fall in place. There were three buses including mine at that time – the KPN multi which left before us from Salem, one Sangita B7R and my bus. 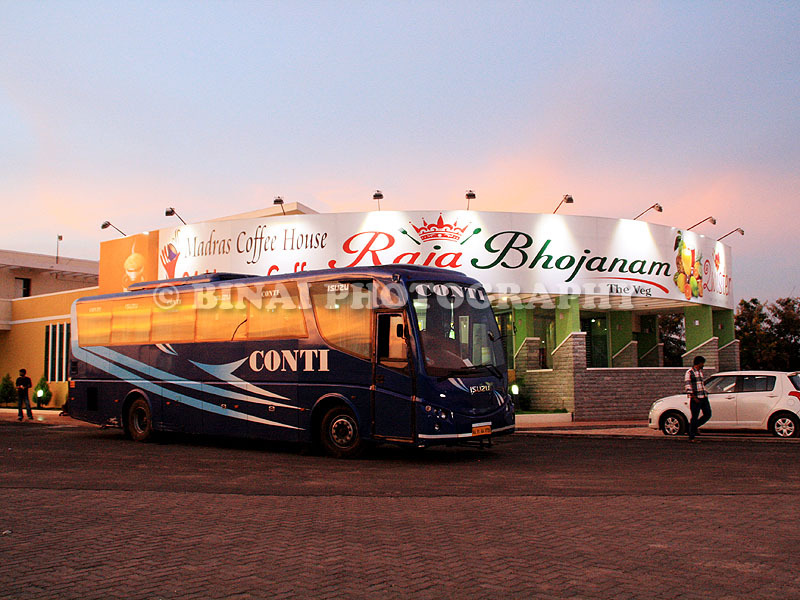 A while after my bus came, the Conti Travels’ Isuzu from Coimbatore too joined in. The place where we stopped for break. That is the Conti Travels Isuzu posing with the hotel. We started from the hotel, after break, at 1827hrs. The second driver took to the wheels now – this guy was disappointing. He was damn slow, and always ended up taking the longest queue at the remaining toll plazas, and even heavily loaded trucks overtook him on the ghat section! This was perhaps the worst driver I have ever seen in the recent past – we lost all the momentum that the first driver had built up. We reached Hosur at 2023hrs – the bus went up to the bus station to drop passengers. It took us two hours to cover a shade over 100kms from the restaurant to Hosur! The Kallada day-service B9R from Ernakulam overtook us just as we got back to the highway – that bus just disappeared from the horizon. My bus stopped briefly before Attibelle toll (2035hrs) and then got moving. The second driver was very disappointing – he was lugging the engine as the road got relatively freer past Chandapura. 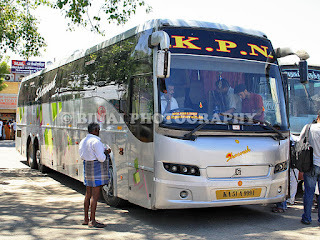 I was overhearing the crew talking in the cabin – they were talking of KPN getting newer buses, which would be put on the Trivandrum route, and so on. As we reached Electronic City, the cleaner announced that the bus would take the flyover – there were no passengers to alight before Silk Board anyways. I called up home and my brother was to pick me from Silk Board. The driver was even slower as we got on the flyover – literally crawling in the middle of the road, with the driver talking continuously on phone. The bus finally dropped me at Silk Board, at 2105hrs – taking 7h 34m for the journey. If it was not for the second driver, we would’ve reached at least 30 minutes earlier. To add salt to my injury, the Conti Travels’ Isuzu came right behind at Silk Board! Concluding remarks: The bus, KA-51-A-9994, had over 5.4lakh kms on the odo. It looked all bruised and abused on the exteriors – but the interiors were kept in good shape. They had put in very colourful curtains – the seats appeared fresh. Probably they were readying the bus for the next FC testing. The bus was being taken to the workshop the next day for some work, and hence the driver wasn’t taking return tickets at toll plazas. The first driver was great – he kept time and maintained pace all the time. Except for one sudden breaking (due to a two legged donkey on a two-wheeler suddenly jumping lanes), the driving was really disciplined. He had the intention of maintaining time. The second driver was a total let down – he was least bothered about keeping pace. The cleaner was fairly passenger friendly. Overall, an average experience. Will I take this service again? I had taken this service since I did not have another choice. But, Yes, I like KPN for their size and reach. Their services are not the best, but not the worst either. I would surely take KPN again – provided, I do not have another choice.